They say “it’s about the journey and not the destination,” but if you’ve ever flown economy across the Pacific for 15 hours, you might take issue with that statement. Sometimes — like when you’re sipping Dom Perignon in your own personal first class suite with your very own bed — it actually can become more about the journey than the destination (or at least pretty close to it). 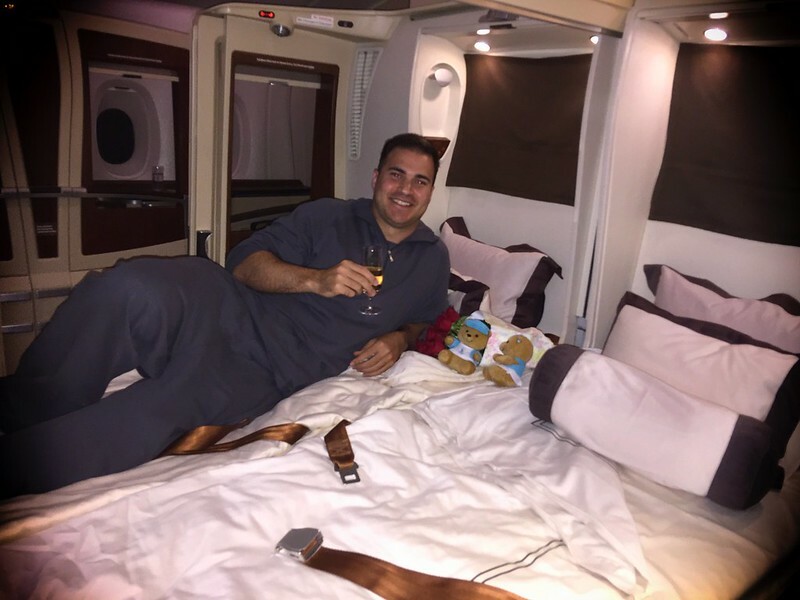 You may have seen articles floating around on social media about people (“travel hackers”) who take exotic trips around the world flying first class and staying in top-notch hotels, all while paying next-to-nothing. These stories all sound wayyy too good to be true and boderline shady, but I can assure you that it is definitely possible and fully legitimate. And not only that, it’s really not that hard to do yourself. Having a glass of Dom just before bed on Singapore Suites. Even on a shoestring budget, you can end up flying first class to just about any destination you’d like to visit in the world. You’ve just got to get familiar with a few things, put in a little bit of time researching, and soon enough, you’ll be booking your award tickets and be ready for your first redemption. The process is simple at the most fundamental level, but it does take a little bit of time to get familiar with the system. Here’s a quick overview of the basics you need to let your travel dreams come true (all while paying next to nothing). Credit cards are the key to making your travel dreams come true. In fact, this entire process revolves around accumulating a portfolio of credit cards and taking full advantage of their benefits and rewards. This means that you need to have good credit and you need to be responsible financially. If you’re credit isn’t too great at the moment, now is the time to work on repairing your credit! It might take you a little extra time to get on board but you can still do it — don’t lose hope! So how exactly do you take advantage of credit cards? The two ways that credit cards most useful are: 1) sign-up bonuses and 2) bonus category spending. Credit card sign-up bonuses are where all the value is at. Without them, we’d all be left with much more moderate traveling prospects. These sign-up bonuses virtually all work the same. You spend $X amount of money (usually about $3,000) in X amount of time (usually about 3 months). After that, you receive a sizable bonus offer of miles or points that you can use toward travel. It’s really a simple process but there’s a lot that goes into it. Are you getting the best offer available? Should I get an airline credit card or a hotel credit card? Is there a way around the annual fee? Can you minimize the impact on your credit score? Are there restrictions for applying for the card you need to know about it? These are just a fraction of the questions I answer on UponArriving to help make it easier on you. Picking the right sign-up bonus can be everything in award travel. The next way that you can get ahead of the game is by efficiently utilizing your credit cards for certain types of purchases. The majority of credit cards I discuss on here offer you bonus points/miles for spending in certain categories, such as travel, dining, gas, groceries, etc. Earning points and miles through spend is pretty straightforward. You spend $100 in a category like hotels that earns you 2 points/per dollar and you end up with 200 points. Which rewards program is best for you (Chase, Amex, Citibank, etc.)? Which reward points are most valuable? What’s the best way to combine earnings with other cards? How can you earn points on things like rent, tuition, taxes, and car loan payments? Again, these things are simple at their most fundamental level but it takes some research effort to discover how to maximize your point earning potential in every aspect of your spending habits. The next major way to supplement your earning potential is to be informed about the latest deals and special offers. Sometimes you can earn tens of thousands of miles for just setting up a bank account or signing up for Direct TV. Other times, there may be a special offer for buying certain products through certain web portals. And sometimes, credit card companies are offering special retention offers or just being generous because you had to wait an extra day to receive your credit card in the mail. These earnings are usually more moderate on an annual basis but sometimes they can be quite huge and definitely add up to a significant sum. This is the most difficult part of the whole process because there are so many factors to consider and the stakes are higher. You need to be vaguely familiar with at least a few award charts and alliance partners, different routing rules to and from your destination, stopover and open-jaw policies, future devaluations, temporary transfer bonuses, award seat availability, cancellation/modification policies, etc. You also need to know when you shouldn’t use your points! The redemption part of this process takes the longest to get familiar with and involves the most time in executing. After all, it can render your hard-earned points essentially useless if you screw up the redemption end of things. Learning how to use your points efficiently is crucial to maximizing value. The steps in the guide below will take you through the whole process from beginning to end. If you’re completely new to award travel, you’ll have enough knowledge of the process after going through these steps to start on your own journey to allowing your own travel dreams come true.